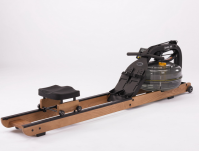 Virtually maintenance free and designed for the toughest commercial environments (even CrossFit style training), the outstanding Vortex PRO 2 Fluid Rower will engage your members in one of the most effective forms of exercise available. Interactive Performance Monitor (IPM) with USB port: The IPM displays: time; speed; distance; stoke rate; calories per hour; watts; 16 level adjustment, pacer, and has a heart rate receiver built in. The Apollo Hybrid AR Indoor Rower is a favourite pick for the home gym. Featuring the highest quality, hand lacquered American Ash, and the strength and integrity of a steel frame – it offers both good looking form and high performing function. Whatever your exercise goals, you will appreciate the realistic on-water rowing emulation of the Apollo Hybrid AR Indoor Rower. FDF’s patented Variable Fluid Resistance technology enables you to move from feather light weight to Olympic challenge at the turn of a dial. There’s no dead spots – experience consistency of resistance, with instant catch throughout the entire stroke. Experience the sight sound and feel of on-water rowing with the Neptune Challenge AR Fluid Rower. FDF’s compact designs are a home gym favourite, offering durability, exceptional performance and quality at an affordable price. You won’t be disappointed with the natural catch and feel of the Neptune Challenge AR. Experience consistency of resistance throughout the entire stroke with FDF’s patented adjustable resistance. 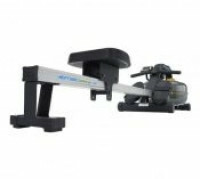 This indoor rower instantly adapts for progressive training and intervals with resistance change possible at the turn of a dial. The Neptune Challenge AR Fluid Rower is designed to function in small spaces while offering one of the best low impact, whole body workouts. From its easy setup, function and storage, this indoor rower is maintenance free and will provide you with a satisfying fitness program.